In most people, the word "kebab" is synonymous with the smell of bonfire in the evening outdoors and the company of close friends. So the meat turned out surprisingly tender and juicy, and the barbecue has fully justified your expectations, try to marinate it in mayonnaise. Prepare the meat. If necessary defrost it. It is better to plan well in advance. Pork rinse well, gently Pat dry. Well sharpened knife cut the meat into small pieces the same size (cubes with sides of 2 cm). Put the meat in a bowl. Salt and pepper the meat. Mix well and leave for 10-15 minutes. Then add the mayonnaise and again mix thoroughly. The mayonnaise has evenly coated all the pieces of kebab, but in this case it should not be too much to the meat of it floated in the water. Peel the onion and slice into wide rings. Add the onions to the meat about gently stir. Cover the barbecue lid and leave to infuse at room temperature for 1 hour. 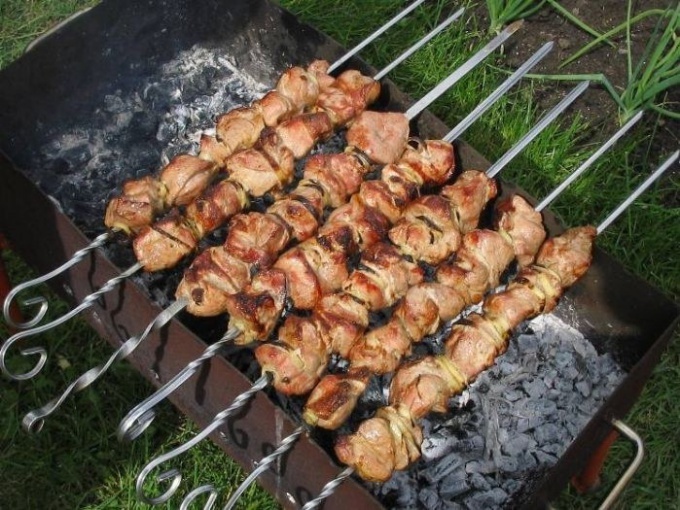 Then remove the skewers into the refrigerator for 10-12 hours or leave in the room for 3-4 hours. Attach the pieces to the skewersand the skewers, alternating with onion rings. Cook the meat on charcoal until cooked. The willingness of the barbecueand can determine, by making an incision with a knife, - meat juice should be transparent. So the meat did not burn and remain juicy during roasting, periodically pour water, wine, beer or kvass and turn the skewers. It is generally accepted that the most tasty shish kebab turns out from pork. You should only choose the pork is not very fat and preferably fresh, not frozen. The most tender part of the pork neck. Skewers of it is juicy and not too fatty. Recipes barbecue beef is also very popular, but kebabs beef is tougher and not as juicy. If you still prefer beef, it is perfect for kebabs is sirloin or loin. The lamb kebabs taste. Fans of the meat it is best to roast a leg of lamb, ribs or shoulder blade. Only eat the dish immediately, as the lamb cools down quickly. Please note that the more you marinate the skewers in mayonnaise, the pork becomes softer. Optionally in the marinade, you can add the same seasoning for meat, seasoning for a shish kebab, Basil. Barbecue is a beautiful combination of various fresh and stewed vegetables, vegetable salads, parsley and dill, potatoes and different sauces.